Have you eaten Nigerian Pepper Soup before? If you have then, you would agree with me that it is not just spicy but also delicious and will make you lick your fingers. Pepper soup is one of the most popular Nigerian soups. It can be eaten with some healthy Nigerian swallows such as agidi, garri and semolina. It is also known for its good nutritional content for the body. This interesting article will help you learn the health benefits of Nigerian Pepper Soup 🌶. You will also get to find out the ingredients which make Nigerian Pepper soup healthy and how to enjoy Nigerian Pepper soup. Is Nigerian Pepper soup healthy? The health benefits of Nigerian Pepper soup is dependent on the ingredients used to prepare it. It is typically made with Nigerian herbs and spices, and interestingly some of these herbs and spices are used in traditional medical treatments. One of the major ingredients in Nigerian Pepper soup is the African nutmeg, which is scientifically known as Monodora tenuifolia. African nutmeg is known as Ehuru ofia or Ogbono to the Igbos, “Gujiya dan miya” to the Hausas or “Abo làkòòs or ariwo” to the Yorubas. , It is a very aromatic seed which is roasted, and then ground into a powdered form before it is added into the soup. Another factor that determines the healthiness of Nigerian Pepper soup is the stock used to consume it. 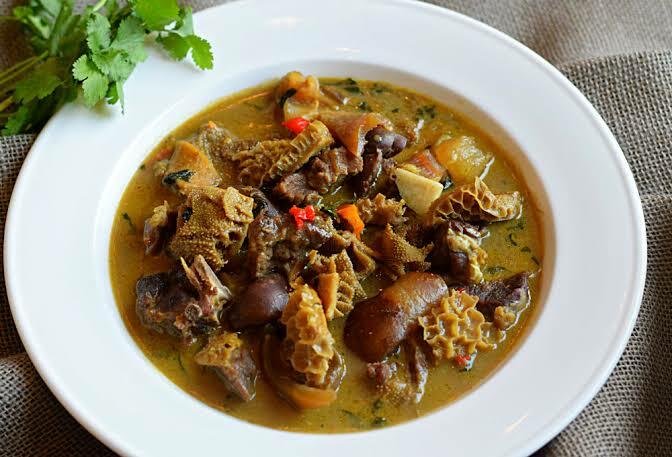 For example, replacing beef with dried steak and replacing red meat with fish can make the pepper soup healthier. Now, let’s find out the health benefits of Nigerian Pepper soup. Nigerian pepper soup is so good for losing weight. Since the main content is pepper, it causes you to drink more water and helps you eat less, causing you to lose weight. The spicy flavor from pepper also burns fat on the body by triggering an increase in body temperature, which caused fat to be burned and expelled through sweat. If you want to lose weight, the Nigerian pepper soup is a healthy Nigerian weight loss food for you. Nigerian pepper soup also stimulates one’s appetite. Most diseases can cause one to lose their appetite. But pepper soup can help such ones regain their appetite. It has a powerful aroma, that can stimulate your hinder senses. Nigerian pepper soup is also used as a natural remedy to treat cough, colds and many other respiratory problems. The pepper present in this food provides internal heat to the body. It relaxes the respiratory system. Hence, the respiratory system becomes more relieved. Another interesting health benefit of Nigerian Pepper soup is that it is great for the heart health. It helps to regulate heart rate and functioning. READ How Unhealthy Eating Can Lead to Snoring? Many people have asked: Is Nigerian pepper soup good during pregnancy? Well, it is. But it also great for women who just gave birth. Nigerian pepper soup is usually served to women immensely after childbirth. There is a reason for that. The reason why Nigerian pepper soup is good for women after childbirth is because it heals passive uterine haemorrhage immediately after giving birth. 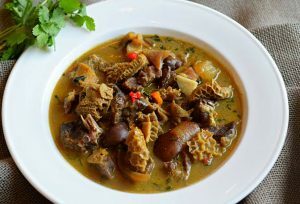 Another benefit of pepper soup is that it has anti-bacterial and anti-inflammatory abilities. Consuming Nigerian pepper soup will make the body healthier and boost your immune system. 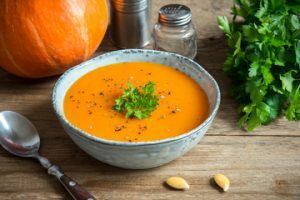 When properly soup is eaten with enough vegetable, leaves and herbs, it automatically becomes food for healthy digestion. It relaxes the gut and enhances bowel movement. African nutmeg when present in Nigerian Pepper soup makes it great for the teeth. In the past, nutmeg was used to treat a toothache. Pepper also helps to prevent cavities and improves dental health. What makes Nigerian pepper soup so healthy are the ingredients used or added to prepare it. 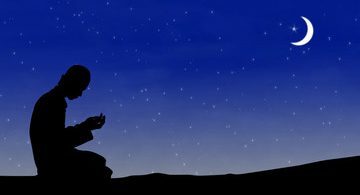 For example, unripe plantains, the fresh fish, the goat meat (isi ewu) the palm oil and others are all such in antioxidants. When all these nutritious products are used when preparing the pepper soup, it gives the body antioxidants that helps to destroy free radicals (cancer-causing agents). It is always good for the body to be hydrated. One of the best ways to ensure that your body is hydrated is to consume Nigerian pepper soup. It even makes you drink a lot of water due to its spiciness. • Eat/Cook your pepper soup with healthy Nigerian leafy vegetables. • Use African nutmeg to cook. • Opt for dried steak, chicken and fresh fish instead of red meat and beef or pork when consuming pepper soup. • Eat with plenty of water instead of alcohol, wine or juice. Now you know the health benefits of Nigerian Pepper soup, you should cook and enjoy it better. Thanks for reading. Please share this post to all your friends and leave a comment below.